Ingrid Daubechies, James B. Duke Professor of Mathematics and Electrical and Computer Engineering at Duke University, will be presented with the Fudan-Zhongzhi Science Award at the 2018 Fudan Science and Innovation Forum on December 16, 2018 in Shanghai, China. Daubechies is the only recipient of the award in 2018 and the sixth person to receive the honor. Candidates are by nomination only and are scientists in the fields of mathematics, physics and biomedicine. Recipients of the award are chosen for their significant achievements in science and technology that have substantially improved our global society and quality of life. 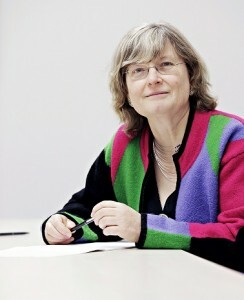 Daubechies was selected for her remarkable contributions to wavelets, her leadership in developing wavelet theory and modern time-frequency analysis, her deep influence on many areas of data analysis and scientific computing, and her contribution to image compression, analog-to-digital conversion and thresholding-based algorithms for inverse problems (Fudan Website). She is a member of the US National Academy of Sciences and the US National Academy of Engineering. Daubechies has been a speaker for several IPAM workshops and an organizer of the Adaptive Data Analysis and Sparsity workshop in 2013. She gave IPAM’s annual Green Family Lecture Series in 2016.